Visit ancient temples, experience stunning sunsets an crazy Kuta nightlife, learn to surf, spot wild Dolphins, learn the true local way of life when you visit a Balinese family, discover all 3 beautiful Gili Islands, snorkel with turtles, trek to the summit of an active Volcano for a once in a lifetime sunrise and more! When you land in Bali after your long flight we'll be at the airport to meet you and take you to the guesthouse. You'll have plenty of time to recover from your flight, chill out and meet everyone in your group. Explore a beautiful temple on a cliff edge in Uluwatu, work on your tan on the iconic Seminyak beach, enjoy one of the world's most beautiful sunsets before experiencing some crazy Kuta nightlife! Learn to surf with Balinese surf dudes in the chilled out coastal town of Canggu. End the day sipping a beer and watching the sunset over the waves. Day 4 we head to the north of Bali to the amazing Lovina and stay in our own stunning private villa. Along the way we'll visit temples, epic waterfalls and rice paddies. The next day we spot wild dolphins cruising on a traditional boat before visiting a local family and learning about true Balinese life. We travel by fast ferry to the stunning Gili Trawangan - a beautiful tropical island off the coast of Bali. We'll explore the island by bicycle, relax on white sandy beaches, take in a gorgeous sunset including the iconic sunset swing! We'll travel by boat around all three beautiful Gili Islands, snorkel in crystal clear water with a good chance of spotting some turtles! After a delicious dinner and island party we'll make our way to Ubud on day 9. Today you'll experience the famous Monkey Forest in Ubud. A fascinating temple home to hundreds to wild monkeys you can get up close and personal with! We'll be there to greet you at Bali airport after your long flight and take you to the Guesthouse. To download more detailed notes on our awesome Bali Intro trips click here. 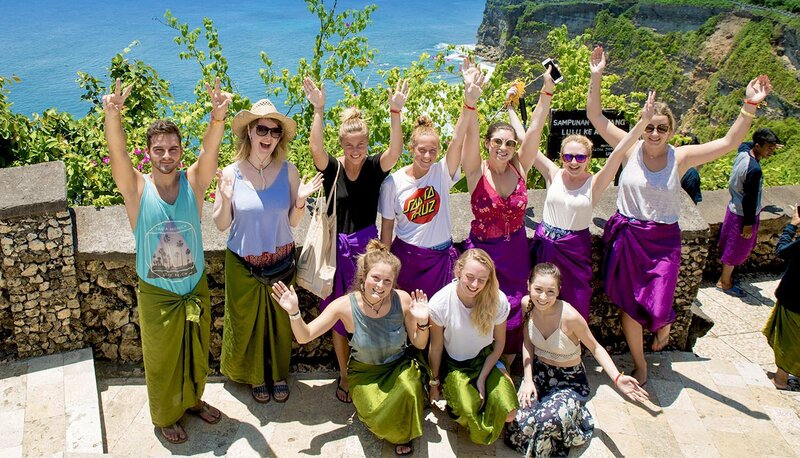 We've been operating in Bali for over 5 years now and Bali Intro is one our most highly rated group tours! Visit ancient temples, experience stunning sunsets and crazy Kuta nightlife, learn to surf, spot wild Dolphins, learn the true local way of life when you visit a Balinese family, discover all 3 beautiful Gili Islands, snorkel with turtles, trek to the summit of an active Volcano for a once in a lifetime sunrise and more! BALI INTRO has an average rating of 4.8/5 based on 2,255 customer reviews. Inge made the trip an amazing experience and it wouldn’t have been the same without her!